What no danish with that coffee? Very cool photo. I love to blog from coffee shops. I actually had lunch there that day. Soup, sandwich… 🙂 Otherwise there would be a little sum-some’in sweet with my coffee. Hey Jane, thanks for stopping by. It isn’t bad, really. Kind of weird at first. I don’t like coffee shops when they’re busy, though. If I can find a nice one where I can grab a little quite with my laptop, maybe I will. But it isn’t something I’d do every day. I’m the same with busy places. I tend to hide at home too much, so trying something like this would probably be good for me! Haha. Well, then there’s the opposite – people who can’t stand to be home/alone. I like that happy medium, out at the coffee shop, but not a busy one 🙂 Works for me. – And we’re all weird. Some of us just wear it in more subtle colors. My colours aren’t subtle, my belly is bright yellow! My daughter lives in Austin and I love going to little hole-in-wall places and writing!! Sorry I have not been blogging lately! I have been taping shows. What was I thinking?? Hah! Maybe it is a good thing I wasn’t thinking! If you get a minute, check it out. I’d love to hear what you think. I am inviting all my blog friends over for feedback. http://www.dishingwithdebbie.com/on-the-show-temp.php Your stories are great and my whole idea behind this show is for other moms to share real stories like you do. Sponsors are donating neat prizes like chocolate baskets and mini-chef aprons and way cool cookery stuff. Anyway, I’d love to hear from you. 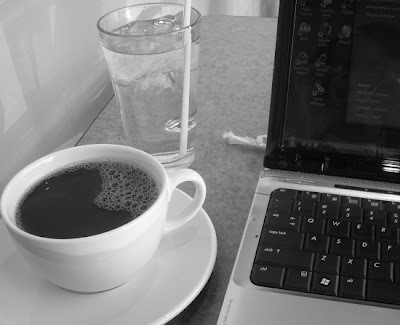 I like blogging from coffe house. It’sso enjoy.